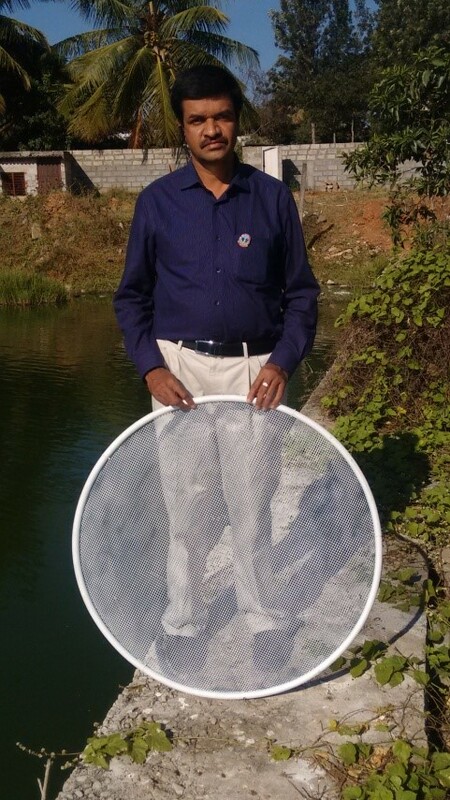 A new technology developed by a Mysuru-based firm which protects babies and pregnant women from the ill-effects of contaminated water and also purifies polluted lake water, was unveiled at the 103rd session of the Indian Science Congress (ISC) recently. Prithvi Eco Sciences Pvt Ltd, a biotech research and development company established in 2011, has developed photo catalyst rings that treat sewage water. The company was formed when Managing Director K Madhusudhan’s wife, a gynaecologist at the Bharath Diagnostic Centre on Irwin Road in Mysuru, noticed that the number of defective babies in the city were constantly on the rise, as revealed by anomaly scans during pregnancies. “We started discussions with endocrinologists about the sources and causes of this. We came to the conclusion that water contamination with persistent organic chemicals and carcinogenic combines was responsible. This is also the cause of a host of illnesses among women such as Poly Cystic Ovary Syndrome (PCOS) and Poly Cystic Ovarian Disease (PCOD), apart from thyroid and hyperthyroid,” said Madhusudhan. After consultations with experts, the team came up with a consortium of 120 microbes such as lactobacillus and filamentous fungi that could treat sewage water. The equipment developed by Prithvi consists of proprietary nanomaterial coated on a ring, with mesh in between. The new technology just requires one to set afloat meshed rings in a degraded lake, sit back, and let them work their magic. A standard 50-60 acre lake requires 40-50 rings for restoration within 24 hours. The first lake to be purified by the technology was Karanji in Mysuru. The product was then tested in the Habaada Lake and Hebbal Lake near BEML Ltd in Mysuru’s outer ring road. “I know of farmers near Hebbal who used our product for treating sewage water. Next day itself, they started using the treated sewage water for irrigation purposes,” said Madhusudhan while publicising his product at the Pride of India Exhibition at ISC 2016. Madhusudhan said that lake development authorities in Rajasthan and Nainital, apart from a host of NGOs, had approached the company to sell off its product. “The advantage of our product is that it requires very little manpower,” he said. Madhusudhan said that his company was also trying to involve industry and the community in restoration of lakes in and around Mysuru. Prithvi involves corporates by proposing lake restoration projects as part of their respective CSR activities. For instance, they approached Biocon Ltd, an Indian biopharmaceutical company, for restoration of three lakes in Bengaluru. “For the community, we introduced water flow regulators in various apartments in Mysuru and requested them to use soaps with lesser phosphate content. This brought down water consumption in these apartment complexes by almost 20 per cent,” he said.